Manga Entertainment today announced that Shin Godzilla’s UK theatrical release has been extended across the UK and Ireland, from 40 to now 100 sites when it roars into cinemas on 10th August for one night only. 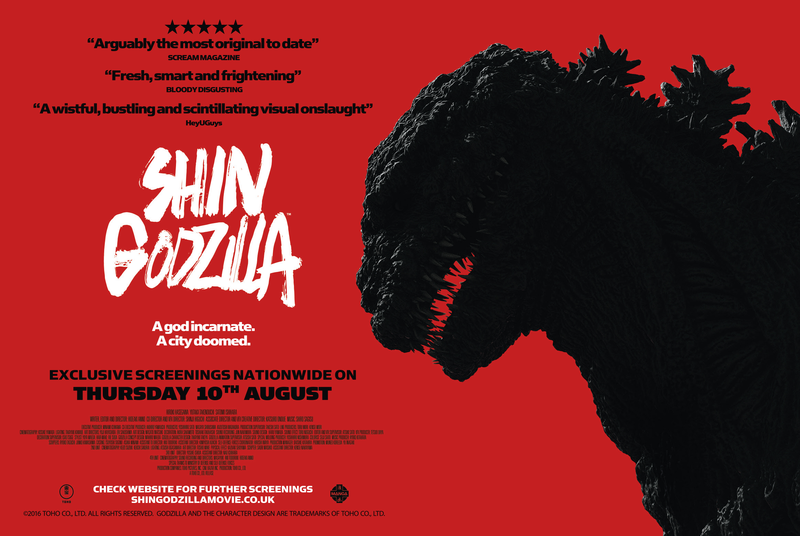 The increase in sites and screenings comes from the fantastic fan support of the iconic science fiction monster’s latest outing from Toho Company, Ltd. Tickets for the film are now available for pre-purchase on the official film website: shingodzillamovie.co.uk. To celebrate, the new quad poster and new stills have been unleashed and are available to download. Aberdeen Cineworld, Basingstoke Vue, Bath Little Theatre Picturehouse, Belfast Odeon, Belfast Odyssey, Birmingham Empire, Birmingham Cineworld, Birmingham Broadway Plaza Odeon, Birmingham Electric Picturehouse, Birmingham Mockingbird, Bluewater Showcase, Bournemouth Odeon, Bradford Picturehouse, Brighton Odeon, Brighton Picturehouse, Bristol CDL Showcase, Cambridge Picturehouse, Cambridge Vue, Cardiff Showcase, Cardiff Tramshed, Clydebank Empire, Colchester Odeon, Coventry Showcase, Derby Showcase, Derby Quad, Dublin Movies@, Dublin Cineworld, Dublin Lighthouse, Dudley Showcase, Dundrum Movies@, Edinburgh Cineworld, Edinburgh Cameo, Exeter Picturehouse, Exeter Vue, Exeter Phoenix, Gateshead Vue, Glasgow Showcase, Glasgow Renfrew Street Cineworld, Guildford Odeon, Ipswich Empire, Leeds Showcase, Leicester Showcase, Leicester Phoenix, Liverpool Showcase, Liverpool FACT Picturehouse, Liverpool One Odeon, London Hackney Picturehouse, London Picturehouse Central, London Brixton Ritzy Picturehouse, London Panton Street Odeon, London Prince Charles, London Westfield Stratford Vue, London Genesis Mile End, London Newham Showcase, London Stratford Picturehouse, London Camden Odeon, London Clapham Picturehouse, London Crouch End Picturehouse, London Finchley Road Vue, London Holloway Odeon, London Islington Vue, London Wood Green Vue, London Kingston Odeon, London Croydon Grants Vue, London Greenwich Picturehouse, London Greenwich Odeon, London Wandsworth Cineworld, London Wimbledon Odeon, London Westfield Vue,Manchester Showcase, Manchester Printworks Vue, Metrocentre Odeon, Milton Keynes Stadium Odeon, Northampton Vue, Norwich Picturehouse, Norwich Vue, Nottingham Showcase, Oxford Vue, Paisley Showcase, Peterborough Showcase, Plymouth Vue, Portsmouth Vue, Reading Showcase, Sheffield Cineworld, Sheffield Showroom, Southampton Picturehouse, Southampton Showcase, Southend Odeon, Stratford upon Avon Picturehouse, Sunderland Empire, Swansea Vue, Swindon Empire, Teesside Showcase, Walsall Showcase, Watford Vue, Wigan Empire, Worthing Connaught, York Picturehouse, York Vue. Co-directed by Hideaki Anno (creator of Evangelion) and Shinji Higuchi (director of Toho’s 2015 Attack on Titan live action movies), Shin Godzillais the 29th Godzilla film produced by Toho and represents a brand new chapter in the 62-year history of this celebrated movie monster. The film stars Hiroki Hasegawa and Satomi Ishihara – both also from the Attack on Titan live action movies – as well as Yutaka Takenouchi. Shin Godzilla has been a big hit in Japan since its opening on 29th July 2016, which garnered a box office of ¥ 845,675,500 and total audience of 564,332 during its first three days. To date in Japan, the movie has grossed ¥ 8,200,000,000 at the box office. The film also received its North American theatrical release in October 2016, and has grossed $1,918,403 in the US and Canada.